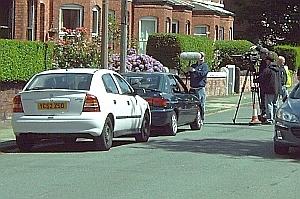 We have been taken over by a Coronation Street film crew! In the road next to ours, they have been shooting a scene with Tyrone Dobbs (Alan Halsall), Mollie Compton (Vicky Binns) and Jackie Dobbs (Margi Clarke). There is also a sinister looking character watching from his car. The road has been renamed Royce Street and, although it isn’t closed to the public, there are men in reflective vests discouraging motorists from slowing down to see what is going on. A coach full of extras is parked nearby, together with catering vans, and a dozen other vehicles. There is an awful lot of standing around! Manchester, England looks likely to get a congestion charging scheme to penalise motorists using the roads when they are most needed. As a sweetener, some of the revenue raised will be spent on local public transport. It’s a hotly debated topic, and whilst the basic purpose – to reduce rush hour traffic – is a Good Thing it has many implications which need to be thought through. These incude the effect on Manchester businesses, house prices, the cost of deliveries, disadvantaging the less well off, increased pressure on public transport and so on.